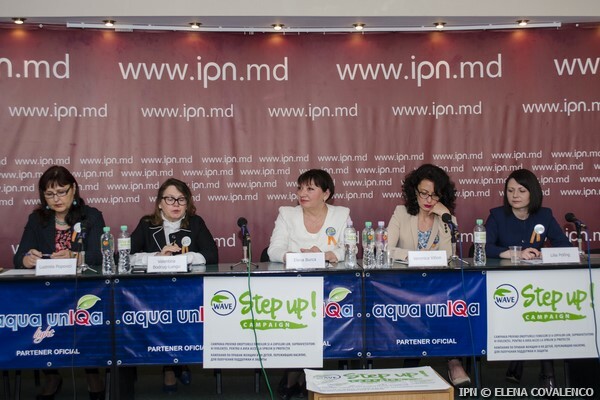 National Coalition “Life Without Violence” and the Platform for Gender Equality brought to Chisinau the international campaign “WAVE Step Up!” on Wednesday, 25 May 2015. The campaign promotes the rights of women survivors of domestic violence and their children, and facilitate access to support and protection. The organizers intend to lobby authorities to develop support services for victims of domestic violence. At a press conference at IPN, Ms Elena Burca, Director of the Association against Violence “Casa Mărioarei”, a member of the Coalition, said that the campaign will last two years. Campaign actions will be directed at decision makers. “Emphasis will be placed on opening access to specialized services for survivors of violence and on quality, e.g. opening centers, supporting NGOs,” said Elena Burca. According to her, to get a better result, the campaign will focus on two issues: domestic violence and sexual violence. Elena Burca argues that the focus on these issues will ultimately achieve the improvement of specialists in the field, both in terms of public decision-making and philanthropic support. The Coordinator of the National Coalition “Life Without Violence”, Ms Veronica Vition said that domestic violence is a very serious problem, but not fully acknowledged as a priority by society. “Violence is considered a family matter, which should not be externalized. A “silence rule” is at work.” said Ms Vition. The President of the Platform for Gender Equality, Ms Valentina Bodrug-Lungu, said that gender stereotypes have a direct impact on the situation in the family. In her view, violence occurs on issues such as the division of roles in the family, educating children and spending money. Domestic violence must be tackled at all levels, starting from decision-making to the general problem in society, which requires campaigns directed to different population groups. Ms Ludmila Popovici, Executive Director of the Centre for Rehabilitation of Torture Victims “Memoria”, mentioned how very painful it is that until now, the direct assistance to victims of domestic violence was not a priority, neither for the state nor for external donors. According to her, it is direct assistance that can have the most important role in prevention. Ms Lilia Potîng, Lawyer at Promo-LEX, noted that Moldova has serious problems and an incomplete legal framework to implement legislation that protects victims of violence. “The attitude of authorities, who must be involved in solving cases of domestic violence, is just not appropriate,” said Lilia Potîng. International campaign “WAVE Step Up!” was initiated by the network “Women Against Violence Europe” present in 46 countries. The concrete actions to be undertaken in Moldova will be established within a working group that is to meet in the near future.